Find our cheapest flights to Sydney from Auckland, Wellington and Christchurch. For a holiday or short break, Sydney knows how to make the most of every moment. The best things about Sydney are free: sunshine, beaches, harbour views and walks. Only in Sydney can you kayak around the Sydney Harbour Bridge, swim in an ocean pool, hike the urban coast and dine on a CBD rooftop - all in the same day. Once you’ve mastered the public transport system (and that won't take long), you can plan a trip to Sydney that includes everything your heart desires, plus some unexpected experiences. Air New Zealand flies non-stop from Auckland to Sydney three to five times a day every day of the week. Additionally, we operate non-stop flights from Wellington, Christchurch and Queenstown several times a week. On all flights you have a choice of Seat, Seat + Bag and The Works fare types. Works Deluxe, Premium Economy and Business are also offered on some flights. Popping over to Sydney for a break is a New Zealand thing. It's great being just over three hours away from a big city that's so full of fun, style and sophistication. And because Sydney is ever-changing, there's always something new to enjoy, like the Shopper Hopper ferry trips to Birkenhead. Or something old, like exploring the WWII tunnel network on North Head. Many visitors to the Emerald City (playwright David Williamson's nickname for the biggest city in Oz) never make it past the CBD. That's a shame, because Sydney’s beaches are really remarkable. From the bronzed-bod vastness of Manly to the serene snorkelling trail of Gordons Bay, there's every kind of beach for every kind of water or sandy pastime. Avalon north of Sydney is a favoured spot for surfing, though Bondi will always be a contender because it's so conveniently close to the city. Narrabeen Lagoon is a superb place for stand up paddle boarding, while Narrabeen Beach has waves perfectly suited to body surfing. If you want to see a lot of beaches in a short time, do the Bondi to Coogee Walk. As well as beaches, it takes you past a succession of ocean pools - some of them are free to use, others charge next-to-nothing (20 cents for McIver Baths, but there's a catch - you need to be female). 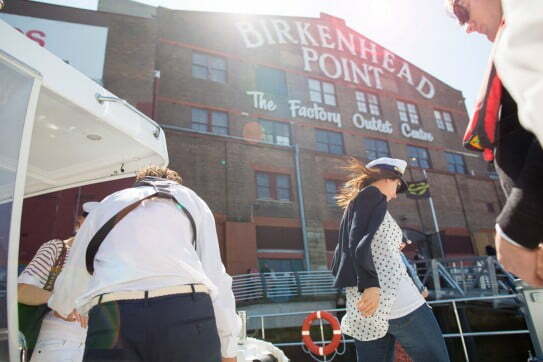 Sydney is ever-changing, so there's always something new to enjoy, like the Shopper Hopper ferry trips to Birkenhead. Or something old, like exploring the WWII tunnel network on North Head. Sydney locals know a thing or two about packing interesting moments into every day. They shop where the tourists don’t shop, in suburbs like Surry Hills, Newtown, Balmain and Rozelle (for the open-air weekend market). They secure tickets for the year’s big events - at the Sydney Opera House and the NRL Grand Final. And they like free events, like Sculpture by the Sea and Vivid Sydney. The insiders of Sydney also love showing unique places to visiting Kiwis. Carriageworks, an arts hub that was formerly a railway yard, is one of those places. It encompasses every kind of creativity - performance art productions, art studios and exhibitions, video works, live music, lectures, workshops and fashion shows. On Saturday morning there’s a farmers' market that includes cooking lessons and producer demonstrations. 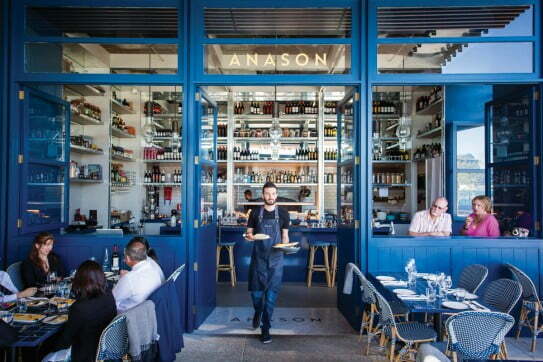 Italian and Greek, Thai and Vietnamese, Middle-eastern and South American, French and Portuguese - diversity is alive and well in Sydney's food scene. And there are a couple of ingredients that are abundant across all the options: creativity and passion. Whether you're eating jamón in a tapas bar or loving the attention to detail at a fine dining restaurant, you can expect to be wowed by flavour and attention to detail. The best restaurants in Sydney are a moving target, so it's good to stay in touch with recent developments, like the Barangaroo restaurant precinct around the corner from The Rocks. Some big names have set up shop here, including Brent Savage and Nick Hildebrandt at Cirrus, a sustainable seafood restaurant; Matt Moran at Barangaroo House, which serves modern Australian cuisine; Somer Sivrioglu at Anason, a contemporary Turkish restaurant; and Sonny Nguyen at Phomo, known for fabulous Vietnamese food. If you haven't explored Barangaroo yet, you’re overdue for a Sydney holiday! Add a couple of extra days onto your holiday and you can extend your relaxation beyond Sydney to the Blue Mountains or the Hunter Valley. Both destinations are an easy 2.5 hour drive from downtown Sydney. Another option is the NSW coast, head south to Wollongong and Kiama or Byron Bay in the north. The ultimate Blue Mountains break could involve heritage accommodation, like the Carrington Hotel, and day walks to discover forests, canyons and waterfalls. If you pick the Hunter Valley as your add-on, wine and food will be the likely focus. The new 10km Hunter Valley Cycleway simplifies the task of getting around the cellar doors. On the NSW south coast, Jervis Bay is a dream destination for a laid-back beachy holiday. You'll find gorgeous Hyams Beach with what has to be the whitest sand in the world, as well as Booderee National Park for bird watching, snorkelling and whale watching (June-July). Byron Bay in the northern corner of NSW, close to the Queensland border, is where you'll see how surf culture, alternative lifestyles and tourism have collaborated to create a unique haute-boho society. The beaches are gorgeous, the food scene is healthily creative and there are nature reserves right alongside the sand. 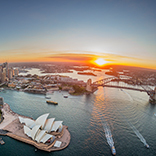 Did you know this site can be used to create Sydney travel packages? It's easy. During the fare booking process, you’ll have the option of adding a rental car. After you've paid for your flights to Sydney, return or one-way, we'll give you the option of booking accommodation through Expedia. Job done! If you're interested in cheap non-stop flights to Sydney, we run regular special offers. You can sign up for low fare alerts to receive early notice of these offers. You can also sign up to our newsletter to receive regular updates about fares, packages, competitions and exclusive offers. Sydney is more of a year-round destination than most cities. Late December and January are the busiest, due to summer school holidays, but you can strike some very hot days. Winter is mild but too cool for lying on the beach, so either side of the summer peak can be ideal if you have the option.